Friday February 12th 1892 It was a pretty cold morning but I walked to town was down to see Mr Collins about weaving a carpet. I stayed at Hatties all day. I finished her edging. I knit some in the evening. Saturday February 13th 1892 It was a fine day. We washed in the forenoon and done most of the ironing in the afternoon while doing the baking. Will and I rode to town in the evening and brought home the carpet rags from Hatties. Sunday February 14th 1892 I walked to church alone this morning alone. Mother helped Josie get the dinner. I read all afternoon and Will and I went over to Marys to spend the evening. Monday February 15th 1892 I was busy about the work all forenoon and in the afternoon rode to town with Will. I was down to see the girls but they were gone. I worked in the carpet rags in the evening. weather quite pleasant. 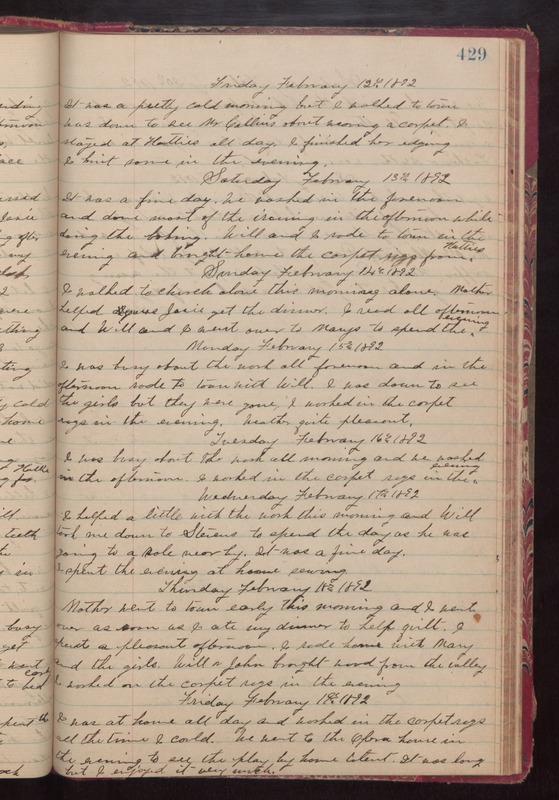 Tuesday February 16th 1892 I was busy about the work all morning and we washed in the afternoon. I worked in the carpet rags in the evening. Wednesday February 17th 1892 I helped a little with the work this morning and Will took me down to Stevens to spend the day as he was going to a sale nearby. It was a fine day. I spent the evening at home sewing. Thursday February 18th 1892 Mother went to town early this morning and I went over as soon as I ate my dinner to help quilt. I spent a pleasant afternoon. I rode home with Mary and the girls. Will & John brought wood from the valley. I worked on the carpet rags in the evening. Friday February 19th 1892 I was at home all day and worked in the carpet rags all the time I could. We went to the Opera house in the evening to see the play by home talent. It was long but I enjoyed it very much.